KIEV, Ukraine -- Ukraine's interim prime minister said in an interview that Russian President Vladimir Putin wants nothing less than the restoration of the Soviet Union. “President Putin has a dream to restore the Soviet Union,” said Yatsenyuk. In an interview to be aired Sunday on NBC’s Meet the Press, Yatsenyuk pointed to President Putin’s influence in Ukraine, where Russia’s geopolitical interests appear to have contributed to mass unrest. Russia annexed the Ukrainian region of Crimea in March, after Ukraine deposed its pro-Kremlin President Viktor Yanukovych. Tens of thousands of Russian troops remain amassed on the border, emboldening separatist groups who have taken over government buildings in the eastern cities of Ukraine. 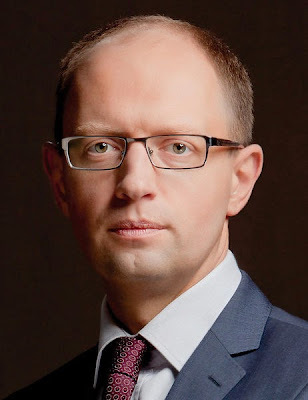 “And I believe that you do remember his famous Munich speech saying that the biggest disaster of the former century is the collapse of the Soviet Union,” Yatsenyuk said. The Ukrainian Prime Minister also had some harsh words for what he called the “bastards” apparently seeking to impose a tax on Jews in Donetsk, eastern Ukraine. “We got information that these so-called peaceful protesters with light ammunition in their hands, that they sent a number of bulletins saying that everyone who is a Jew to be indicated as a Jew,” said Yatsenyuk.